The SCPD is looking for a woman who snatched another person's wallet in a Centereach store. Centereach, NY - January 24, 2014 - Suffolk County Crime Stoppers and Sixth Squad detectives are seeking the public’s help to identify and locate a woman who stole a wallet from a Centereach store. 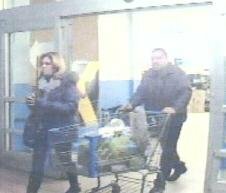 On Sunday, January 5th, 2014, a woman purchased items at the Walmart, located at 161 Centereach Mall. After paying, she dropped her wallet, which contained cash and credit cards, near a checkout counter. Surveillance video revealed that a woman who checked out after the victim picked up the wallet from the floor, put it in her pocketbook and left the store. The suspect then used the victim’s credit card at a gas station. The suspect is described as a white female with blond hair who was wearing a black winter jacket and a scarf. She was accompanied by a man who was wearing glasses, a dark jacket and dark pants. Subject: LongIsland.com - Your Name sent you Article details of "Suffolk Police Looking for Wallet Thief"